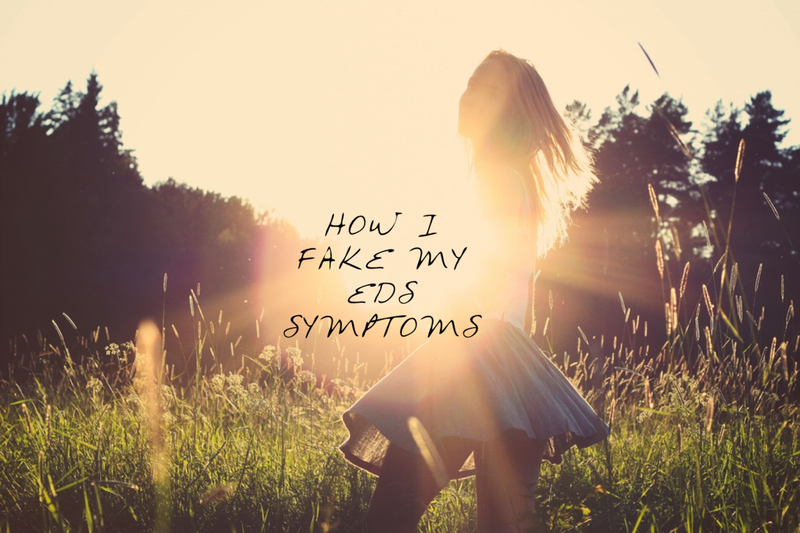 I fake my EDS symptoms all the time. It is second nature, it’s why I am so good at it. Now I don’t mean I’m faking the symptoms of my condition, making them up, exaggerating them, they are very real to me and they are ever present in my life. Quite the opposite in fact, because of the invisibility of EDS I have become a master at faking being ‘normal’. Here are the top twenty ways that I have learnt conceal my illness on daily basis and to blend with the masses – to appear to be normal. One. Smiling… I make a huge effort to have a happy life and try not to let things get me down. 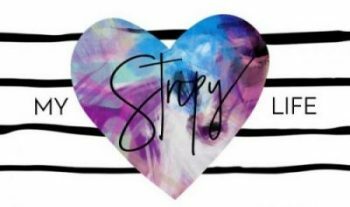 Just because I am happy whilst being ill doesn’t mean that my conditions have disappeared, it simply means I have chosen to be happy in spite of my illness’, which is no mean feat. I have mastered the ‘fine thanks’ response when someone asks me how I am, no one honestly wants to hear the truth! It’s important to be happy, it’s good for your health. Two. Make up…. I put my face on every single day, it is my mask for the real world and I like wearing it. Only those people that know me very well can tell how I am feeling behind the smile and the make up. By looking into my eyes. Even if it’s just a bit of mascara and a sweep of blusher it makes me feel better about the day ahead, more human. Three. Ditching the kettle… I have boiling water plumbed in because I can’t lift a kettle without a dislocation. Four. A pushchair… When my children were young my mobility was at its worst. I would get out the buggy to hold on to when I walked along even if the children didn’t need to sit in it particularly. I would let them hold on and walk slowly with me while it held me up. I miss the fact that they are all too big for a pushchair. Five. Leaning… Standing is hard work 1) because of pain and 2) because standing still makes me dizzy and when things are bad I can be clammy, shivery, breathless and can even faint when upright. You will notice me just propping myself up on a table or a doorway. Six. Fidgeting… Sitting and standing for any length of time is uncomfortable and moving just helps. Fidgeting when I’m standing, calf pumps, fist pumps or squeezing a stress ball hidden deep in my coat pocket can also get the blood pumping to avoid me passing out. Seven. Standing up slowly… Always, to minimise the head rush and dizziness. Eight. Pacing… I am driven, I like getting loads done but I would find that I would push and push only to crash later. Pacing used to be my enemy but I have had to work hard to make it my friend. All of my daily activities are paced and no one would ever know! It increases the amount that I can achieve over a given period instead of feeding into the boom bust cycle. Nine. Hiding fatigue… You can’t see fatigue, unless you know me well and on the days when my fatigue is at it’s worst you won’t see me at all because I physically can not get out of bed or leave the house. My life is planned 24/7 to manage this element but sometimes it creeps up on me and catches me out. I have collapsed before unable to put one foot in front of the other and been rushed to hospital. People won’t know or understand how bad this can get because they just wont see it. Ten. 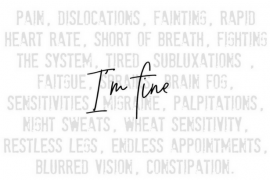 Managing pain… I have become an expert at hiding my pain (and I have a pretty high pain threshold), you won’t see the amount of medication that I take, the ice, wheat cushions, massage, hot baths, propping my joints with anything just to get comfy. I am a master of disguise too, I can be standing, smiling and chatting with someone with a rib subluxated, unable to relocate it and unless I knew you well I wouldn’t even tell you! Eleven. Planning… If I do have something particular on a certain day then an immense amount of planning goes into it. I’m still paying for a Spooky Walk for Halloween a week later in terms of pain and autonomic dysfunction because I had a meal out two days before and didn’t plan enough time for my body to recover in between. Twelve. Avoiding obstacles… This has become like second nature. This time of year just walking to the car there are obstacles, the blanket of Autumn leaves may look pretty but in the dry they mask the unevenness of the pavement beneath and in the wet they are slippery. I always walk around things where I can, or take another route. Thirteen. Wearing a vest… I have the ability to stand in 30 degree heat in the summer and still have goosebumps, I wear vest all year round. I’m also fond of a scarf gloves and a hat. Fourteen. Orthotics / braces… These are hidden in my shoes, under my jeans. Unless something visible like my wrist or thumb was braced you would never know. There was one time this year my ankle was infact braced as it was subluxated and wouldn’t relocate. A mum at school spotted it and questioned if I was wearing a tag! What she didn’t notice was the excruciating pain on my face as I had to bare weight, I have learnt to hide it so well. Fifteen. Tight clothes… Skinny jeans aren’t a fashion statement for me they are a necessity to hold my hips and pelvis in place and increase propreoception to my joints. Sixteen. Eating well… Eating small regular meals helps me to manage a whole host of gastro and autonomic symptoms as does eating gluten free. If you went out for dinner with me would you know by my choices? Seventeen. Being vague with arrangements… This is another one of my coping methods, I can never tell how I will be feeling from one day to the next let alone a week or two in advance so I tend not to make definite plans unless I have to. Eighteen. Linking arms with a friend… To steady myself perhaps because I’m hurting or if I’m walking somewhere tricky; slippy leaves, a wet floor or if its icy. Nineteen. Friends… Making time for a regular cuppa with friends to chat about anything else but Ehlers Danlos, health and hospitals. Twenty. A sense of humour… This is so important when faking being normal. Being able to laugh at yourself and having the ability to look back on situations that have happened with a smile (because there are many) is a must. So when someone calls me a faker in a way the are right, I have become a master at concealing EDS in order to just live, it’s my life and I am going to make the most of it and will not apologise for that. 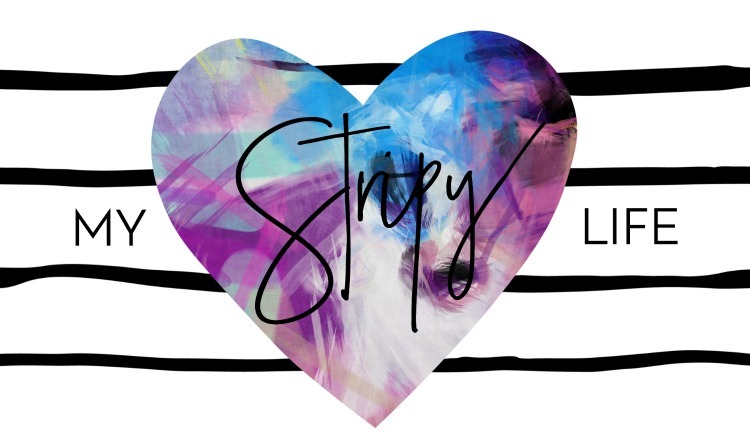 EDS is a huge part of who I am, it never goes away but I am committed to working hard so that it doesn’t become all that I am.This post was picked up and published on The mighty Site you can check it out here and my other published posts. The first week it went up it was the most read post on their site. 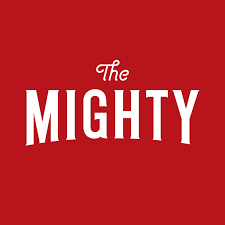 Be Mighty! 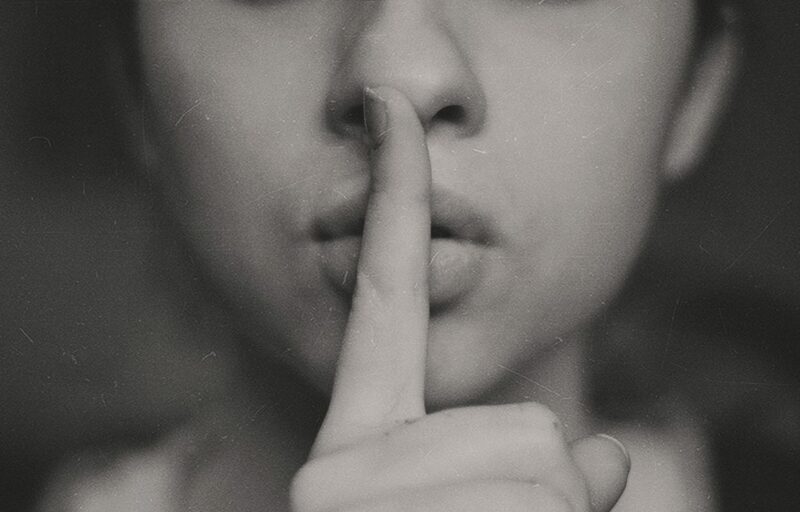 My Invisible Illness Story – Be Kind. Always. Oh, the pushchair….how I empathize with that. I just sank an eye watering amount of money into what will be our last stroller…my daughter is almost 5, and she rarely rides in it, but when she runs out of energy, she is DONE and at 40lbs, is too much for me to carry for very long/far. I get the odd funny look at her in the stroller, but frankly I don't care. If it helps us get out when my joints are angry at me, and when she is having a rough day, people can just mind their own business. ZipHer Head – I never put my face on, but I never have! And noise makes me very sick, so I avoid outings except to dr's. But everything else is spot on. I'm 39 now & didn't get dx'ed until 5 years ago. My entire life has changed in that time frame – not in a good way. Surprise!! But thank you for writing it so I know, once again, I'm not alone in this EDS world. I do so many of these! Thank you so much for sharing, now I don't feel like I'm the only one. I sometimes wonder whether I should actually be honest about how I'm feeling with people, but from experience, unless they're already close to me, they don't usually pay any attention even if I do tell them the truth. I sometimes we could do with a hug, so I'm sending one to you to say well done, not in a patronising way, but in a wow you're amazing way. To have gone through that much and still function each day, even if deep down you don't feel like you are, you're truly amazing. Sounds exactly like our daughter who is 16 years old. I sent it to my husband and if he would have not known it was written by someone else, he would have thought our daughter wrote it. Thank you for sharing. 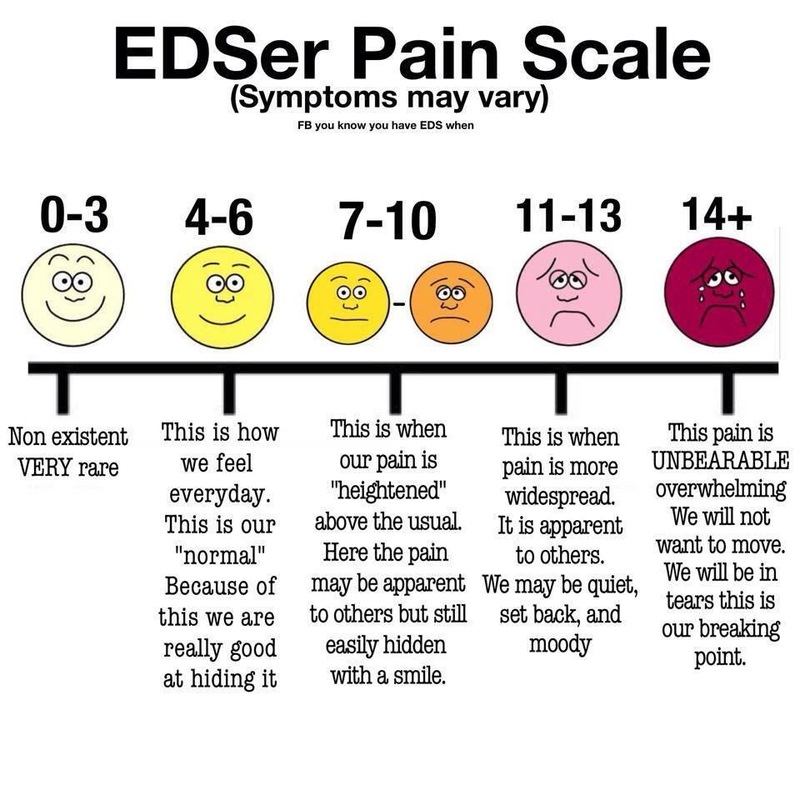 Having a child who as EDS has not been an easy feat lately, especially, when she is also a teenager. It is nice to know there are others who have experienced the same exact symptoms as she is currently.